The Book of Fire is the third in a series of elemental sourcebooks for the L5R Role Playing Game, books that explore the themes of the five elemental Rings. This book includes an extensive examination on the Emerald Empire's emphasis on the art of kenjutsu, the way of the sword, and its many aspects, including how thousands of samurai across the land are trained in its intricacies each and every year. It is includes a detailed discussion of the most sacred of all crafting arts: swordsmithing, the power of Fire magic, new Fire-centered Kiho, and monastic orders associated with Fire. 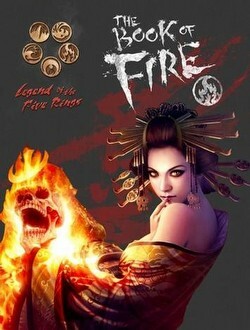 Also included is the Hundred Stances Dojo, a new Fire-themed campaign setting that can be inserted into any L5R game.